After what's felt like an interminably long winter, I've been inspired to write about decorating your patio since it's finally getting warm enough to actually sit outside. Here in Ottawa, the sun is out and the temperature is above 15 degrees, which essentially translates to t-shirt and shorts weather for most people. In addition to picnics and days at the beach, warmer temperatures also signal the beginning of patio and backyard BBQ season. Considering how much time you'll (hopefully) be spending outside, it's absolutely worthwhile making your outdoor spaces pleasant and enjoyable. Most patios and decks are fairly open and exposed to the elements, so it's important to take that into account when decorating. Generally speaking, it's always smarter to decorate your outdoor space with pieces that won't be completely ruined if they were to say, accidentally be forgotten outside overnight and unexpectedly rained on. 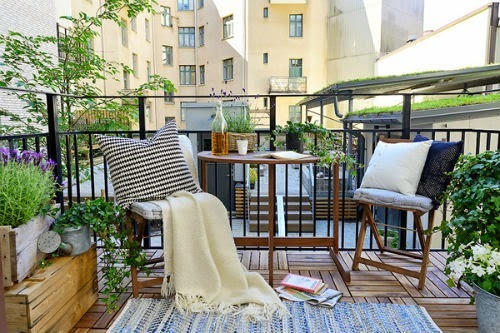 Aside from that, the two main points to keep in mind when you're decorating your patio are to 1. Keep in cool, and 2. Keep it comfy. Considering how hot and humid it can get in the summer, it's incredibly important to make sure your outdoor space provides a sanctuary of cool, refreshing shade. You don't have to completely block out the sun entirely, but you're probably going to want to designate at least one section of your patio as a "sun free zone". After all, if your patio gets too hot and bright, you're not going to want to spend nearly as much time enjoying it. Generally speaking, either you'll be lucky enough to have a patio in an area that is naturally shaded, or you'll have to invest in creating your own shade. There are a number of ways you can do that, with the most obvious and popular option being patio umbrellas. These are always a great choice and are easy to move around depending on where you want the most shade. Alternatively, trees provide a natural shade, and are a beautiful addition to any garden patio. The second thing you're going to want to remember when you're decorating your patio is to make your living space as comfortable as possible. A patio is a place for you to relax and enjoy the outdoors, but it can always be a place to entertain guests, so you're going to want to make it comfortable. Think about it..hot plastic chairs don't exactly sound like something you would willingly want to sit on in shorts right? Instead, opt for the wooden ones and use soft pillow covers to make a seat worth sitting on. When it comes to what fabrics to use, you're going to want to keep it light and airy. Think linens, gauze, and cotton in refreshing colours like cool blue. 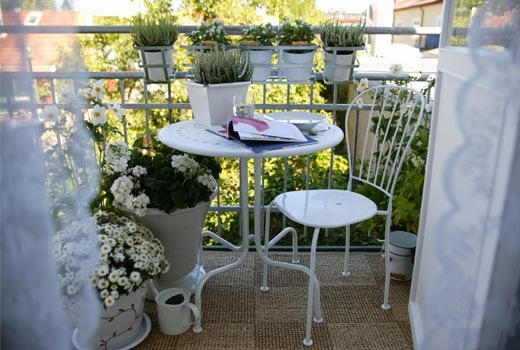 Finally, it's important to make your patio feel like your own personal sanctuary, so feel free to add your own personal touches to make it feel like your own. Not everybody can afford shampoo and conditioner that costs more than an hour (or more) of minimum wage pay. Thankfully, there are a variety of budget-friendly options available at the drugstore. Navigating the plethora of options however, can definitely be tricky, so it’s important to keep in mind a few general rules. This is by far the most important piece of advice to consider, and surprisingly not common knowledge. If you’re unsure about the type of hair that you have or what it’s specific needs may be (lackluster, damaged, dry..), I would advise going to see a professional to have your hair assessed. You can go in for a consultation at most respectable salons for free and they will break it all down for you. This one is kind of a no-brainer, but you’re going to have to remind yourself to stay on budget. If you’re anything like me, this can actually be a tough one because generally speaking, the prettier the packaging, the bigger the price tag. I know this can seem like a waste of time, but it’s important to know what you’re putting on your hair. If you have color treated hair for instance, you’re going to want to look for shampoo that specifically says “sulfate-free” to avoid stripping your color. You’re also going to want to be careful to avoid products that contain heavy waxes, which coat the hair over time. Because most drugstore brand shampoos use fairly heavy duty detergents, the conditioners are designed to mask that by containing waxes to coat the hair. **I used to use the L’Oréal EverCrème Sulfate-Free conditioner until I found out that it coated my hair with such a thick layer of wax that my hair stylist could visibly scrape it off and show me. Just goes to show that even though a product might be “sulfate-free”, it doesn’t necessarily mean it’s “wax-free”. Finding the right budget friendly shampoo and conditioner can certainly be a process. In many ways, it ends up coming down to trial and error. You might try something, really love it for a few washes, but end up hating it by the end of the bottle. 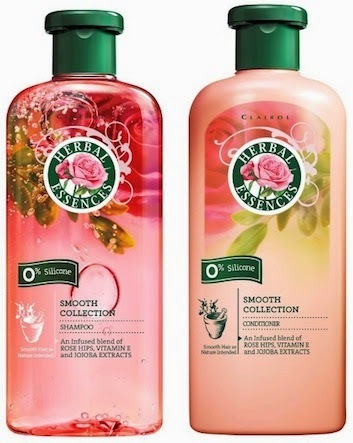 My favorite shampoo and conditioner on a budget is the Herbel Essences Smooth Collection. It smells like roses and comes in pretty pink packaging. It’s been around for awhile, and it’s definitely a classic. Dove is another brand that makes affordable, ethical, quality products, so that’s a pretty safe bet in my books. In the mid-range category, Live Clean and Klorane also makes really great, natural-based products. Finally, if all else fails, go for baby shampoo! If it’s gentle enough for a baby, it’s gentle enough for you too! I’ve heard it said many times that if you’re going to invest in an accessory, make it your hair because you’re going to be wearing it everyday! I think this is actually pretty sound advice and most of the time, I think I do a good job of looking after my locks. To be completely honest though, I know I can be pretty hard on it, especially considering the frequency with which I color and heat-style it. Luckily, there are some really fabulous products out there to help repair and restore your hair! Despite the fact that I lighten my hair, blow dry it, and use either a flat iron or curling iron on it every day, I would say my hair is in pretty good condition. Genetically, I’ve inherited naturally thin hair, although I’ve been told by many stylists that there’s still a lot of it on my head! In any case, this means that whenever I’m shopping for any hair care products to help restore moisture and softness to my hair, I have to be ultra careful about making sure I don’t pick anything that will weigh my strands down. 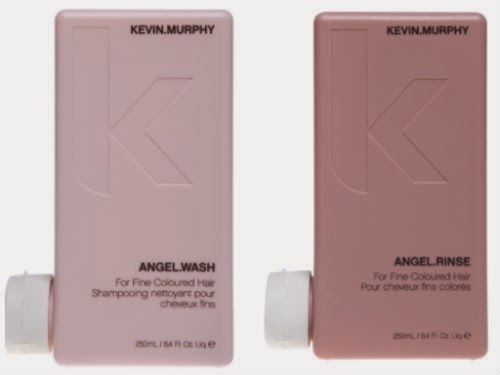 On a daily basis, my absolute favorite shampoo and conditioner is the Kevin Murphy Angel Wash and Angel Rinse, which is specifically designed for fine, color treated hair like mine. Oh, and it also smells really nice too! Even my boyfriend noticed it, and he’s the kind of guy who would only say something if he either really liked it, or really didn’t like it. Since my hair is blonde, I also like to use a toning shampoo and deep conditioning treatment in my repertoire to avoid getting too brassy or dried out. 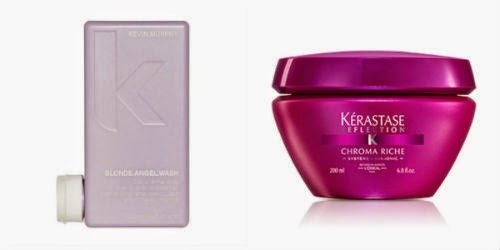 My favorite combination right now is the Kevin Murphy Blonde Angel Wash, which is a lavender infused shampoo, and the Kérastase Chroma Riche Masque, which is an incredibly rich, luxurious miracle worker! Now, unless you’re one of the very rare few who let their hair air-dry every day, it is absolutely necessary to incorporate some kind of heat protection into your routine. 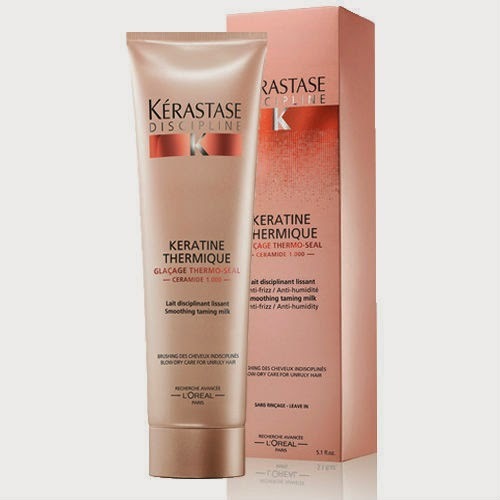 I alternate between the Kevin Murphy Young Again oil, and the Kérastase Keratine Thermique. You only need a small, dime-sized amount of either product, which you work through your hair (starting with the ends) before blow-drying. After that, I either flat-iron, or curl my hair, depending on my mood or the occasion. I almost always wear my hair down, and rarely (if ever) use hair spray or mousse. However, one product I do like to use, is serum. Since my hair is fine, I always have to be careful to only use a very small amount, and never anything too heavy. 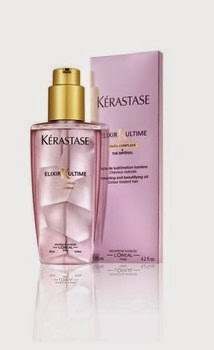 Luckily, I seem to have found my holy grail product with the Kérastase Elixir-Ultime Thé Imperial oil, which is designed for color treated hair. It might seem like a lot of products, and certainly not cheap, but if you’re putting your hair through the ringer, you’re definitely going to want to invest in quality products to keep it looking healthy and beautiful. There is (almost) nothing better than spending a day at the beach, feeling the warm sun on your skin, swimming in the water, and relaxing with friends and family. I have been very fortunate to have had the opportunity to go on many family holidays to beaches both far and near, and I truly cherish those memories. There is just something very special about going to the beach. Maybe it’s the salty air or the fact that going to the beach usually means a day of fun and relaxation, but I know it’s certainly something I always look forward to. 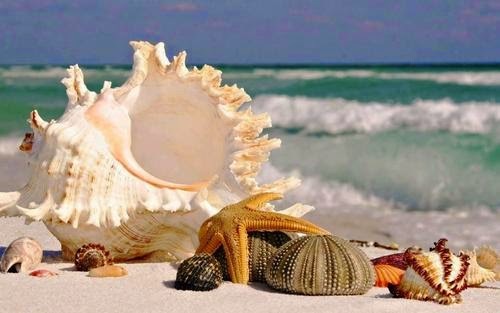 It’s no wonder then, that people have taken elements from the beach, and incorporated them into their homes. There are even ‘beach homes’ for goodness sake! Even if you don’t live a short, sandy walk from the water, there are still plenty of ways to bring the beach to you. In fact, one of the best parts about decorating your home (or a single room) in beach-inspired style, is that you can achieve a great beachy atmosphere without actually having your floors covered with sand. 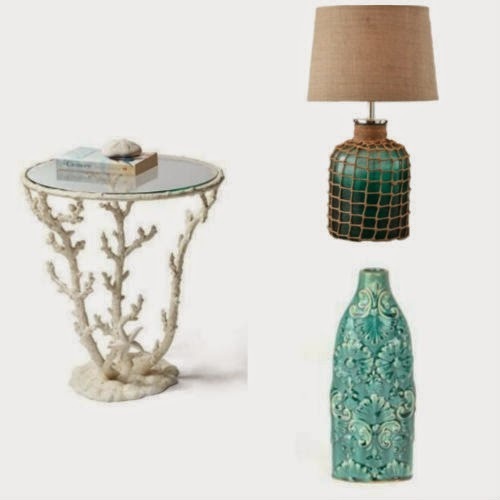 Using accents like wicker, rope, and shell, all add a nautical, beachy atmosphere to any room. Of course, using the colors of the water also serve as an excellent way to bring the beach to your home, all while adding a nice depth of color to a potentially otherwise neutral room. You can read more about how to decorate with shades of blue here. 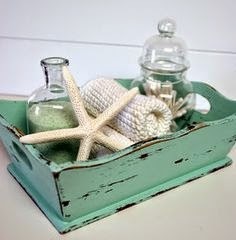 One of the most relaxing ways to bring the beach home is to mimic the aroma of the beach. I personally love the look of candles in any room, and there are quite a few reputable companies out there who make a number of nice scented candles. For instance, Bath & Body Works ‘Oceanside’ candle, or Yankee Candle ‘Ocean Star’ both smell incredible and definitely bring my mind right to the beach. So I have to admit, when it comes to jewelry, I tend to lean more towards the ‘minimalist’ side, rather than the ‘blingy’ side. In fact, when it comes to accessories in general, I like to keep a “less is more” kind of mentality. I’m not saying that wearing a lot of accessories is a bad thing in any way, because truthfully, I think that some women can pull it off quite well, I just find that personally, it’s not in my style comfort zone. Generally speaking, I almost never wear more than one or two pieces of jewelry. On a day to day basis, I wear earrings (my go-to pair are small gold hoops), and occasionally a complimentary necklace. I would love to be able to wear rings and bracelets more often, but as beautiful as they are, they tend to get in the way if you work at all with your hands. In any case, one accessory I am really excited about working into my wardrobe, are statement necklaces. Now, statement necklaces are certainly nothing new, but because they have become such a popular accessory, there is a much better selection out there now than there was say, two or three years ago. Besides their obvious aesthetic appeal, I think one of the things that really appeals to me about statement necklaces, is that they have the same kind of easy, pulled together look that a dress does. Like a dress, a statement necklace is something you can easily put on in order to take your outfit up a notch. In fact, one of my favorite ways to style a statement necklace is to pair it with a neutral colored top in order to make it the focal point of the look. 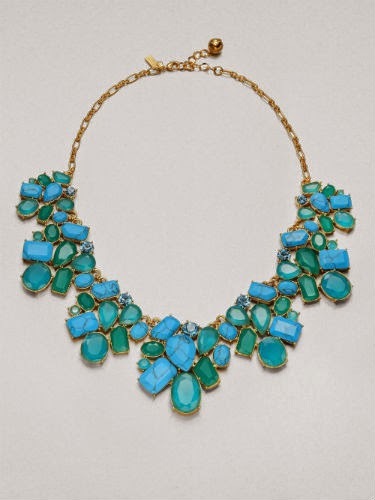 For spring, I’m really pining after bright jewel tone colored statement necklaces like the Kate Spade “Glitzy Spritz” or the BP. “Cabuchon” necklace in light blue. In terms of how to accessorize the rest of your outfit, it’s generally a good idea to keep things light. For instance, if you’re going to wear a classic white tee, cropped denim jeans, wedge sandals, and a coral statement necklace, then I would suggest going with small stud earrings (either gold or matching coral drops maybe? ), and maybe, if you’re feeling particularly bold, a gold bangle or two. Similarly, if you’re wearing that same coral statement necklace with a bold watercolor print dress like this one here, then I would suggest keeping the rest of your accessories even more minimal. Continuing on with the spring trend, I’m going to talk about how to “spring clean” your diet and fitness regime. If you live somewhere cold like me, you probably ate a lot of hearty, if not downright heavy, comfort food over the winter. When the temperature is -40 degrees, it’s hard to resist digging into a shepard’s pie or chicken casserole, and honestly, I don’t see anything wrong with that. I’m a big fan of eating seasonally, and here in Ontario, winter is not exactly the most ideal time to eat a diet of fresh fruit and vegetables. 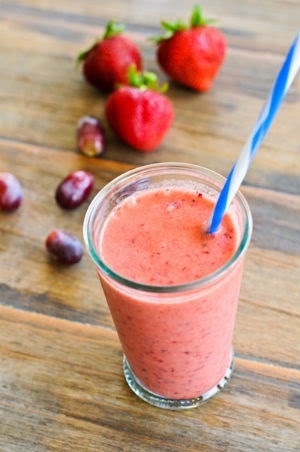 So now that spring is here, I am very excited to finally get back to using my blender for smoothies full of fresh berries! In terms of fitness, winter can definitely make us feel sluggish, and the freezing cold temperatures can certainly turn us off from getting out and going to the gym. Now that the weather is getting warmer, it’s finally time to gradually ease our bodies back into a consistent fitness routine. If your lifestyle doesn’t allow for you to make it to the gym, I would strongly suggest setting aside some time each day to simply go for a walk. It might not seem like much but it’s a great way to get some cardio into your routine, and it’s also an amazing opportunity for you to unwind and get your mind off of whatever stresses you may be dealing with. I would personally recommend walking for at least 30-45 minutes at a brisk pace in order to get as much benefit out of your walk as possible. One of the reasons that walking is so good for you is because it’s not too physically demanding on your body in the way that say, endurance running can be. Considering that many of us let our exercise regimes slide a bit over the winter, it’s also a good idea to ease back into a fitness routine with cardio like speed walking so you don’t injure yourself or overdo it. You can check out my post on athletic gear here for some inspiration! 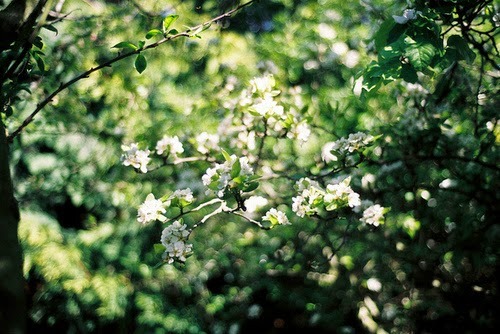 Of all the seasons, I have to say that spring is more than likely my favourite. 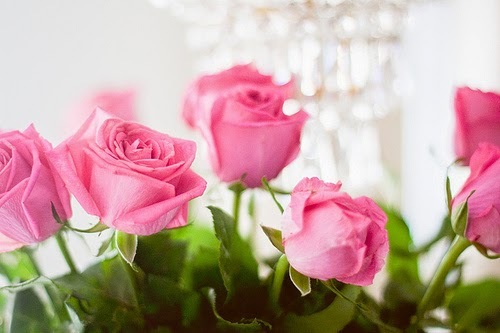 I absolutely love the sunshine, the sound of birds in the trees, and perhaps most of all, the beautiful array of flowers that bloom and grow, filling the air with their sweet fragrances. 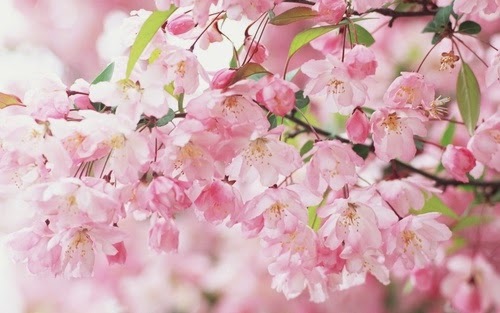 Considering my birthday happens to be during spring, I must admit I am a bit biased, but I just can’t help but think it’s one of the loveliest of seasons. With all that being said, I want to begin my very first post in the travel section of my blog by talking about local travel. In my case, this means touring around Ottawa, and if I get the opportunity,Kingston (where my family lives and where I grew up). Now, let me quickly remind everyone that I am still relatively new here in the city, so I certainly wouldn’t consider myself an Ottawa tourism expert or anything. Since my boyfriend and I moved here in September, this is actually my very first spring in the city. > Check out the museums! My favorite, aside from the Museum of Civilization (which has a big section under construction until 2017 unfortunately), is the Nature Museum. 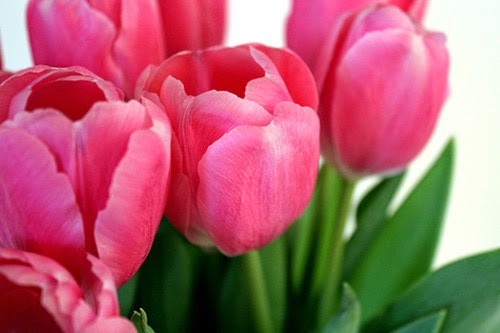 One thing we have yet to do because it hasn’t officially started is check out the tulip festival here in Ottawa! 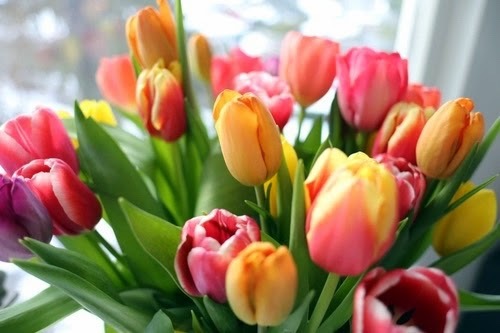 I absolutely love flowers so needless to say I am very excited to go to a festival all about tulips! It’s going to be going on from May 8th to the 18th so I’ll post more on that soon! Ask anyone who knows me well enough and they will vouch for the fact that my absolute favourite colour to decorate with are shades blues . Whether it’s a light, aqua blue, or a dark, teal tone, I absolutely adore the richness of the colour blue. Now that winter seems to be loosening its grasp and signs of spring are beginning to crop up, what better way to liven up your home than with some bright pops of colour? 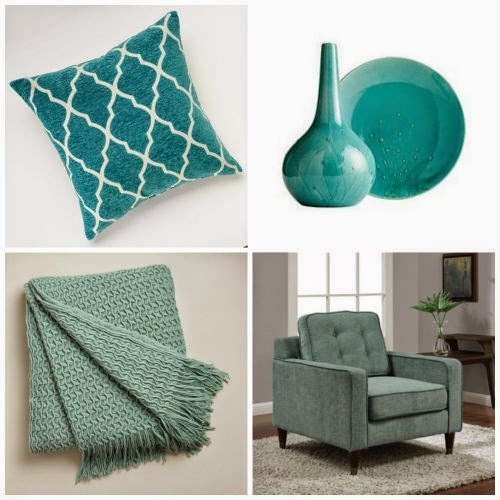 I know some people who are resistant to decorating with anything but neutrals, and I also know people who find shades of blue to be too cold or icy, but what I always say to them is that you just have to find the right tone and work with a variety of textures to create the warmth and character your home needs. 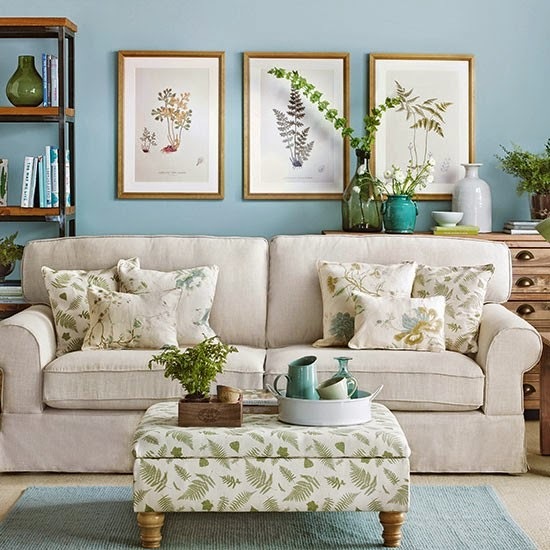 In fact, one of the most beautiful ways to effectively utilize blue tones in your home is to mix it with neutrals (colours) and naturals (textures). By that I mean neutral tones like sand and ecru, and natural textures like soft linens, wicker, and greenery. When decorating a room using shades of blue, the first decision you have to make is whether or not you want it to grace your walls. If you do decide to commit to painting your walls a beautiful shade of blue, you’ll want to keep the rest of your room fairly neutral, with only a few accent pieces to compliment your walls. If you decide that perhaps you want to keep your walls neutral, you can still have lots of fun by playing with the colour in more unconventional ways. A blue couch anyone? One of the only reasons I think anyone can get away with the same skincare routine all year round is if you live in a place where the weather never really changes. For the rest of us, our skin definitely has very different needs in the winter than it does in the summer. That’s why it’s actually very important to have two separate skincare regimes! In the winter, your skin tends to get dry very easily, so it’s important to keep it moisturized with heavier creams and lotions. Comparatively, in spring and summer, when the weather gets warmer and the humidity starts to rise, it’s definitely better to opt for a lighter routine. I have combination skin so I tend to avoid any cleansers or lotions that are specifically geared towards dealing with oily or dry skin. The reason I do this is because I don’t want a skincare routine that only focuses on one aspect of my skin’s needs. Also, I don’t have particularly oily or dry skin anyway so it’s really a mute point. Considering my type of skin and my age (mid twenties), I gravitate towards products that brighten, protect, and prevent signs of ageing. I tend to use a combination of products from a variety of different companies but if I had an unlimited budget, I would almost exclusively use Fresh skincare products. I love Fresh products because they use natural ingredients and combine them with modern skincare technology to create highly potent products that work incredibly well and if I may say so, smell amazing! 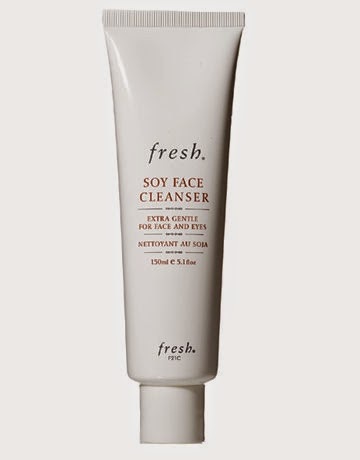 I am a huge fan of the Fresh Soy Face Cleanser, which I first tried as a sample from Sephora a few years ago. It’s so gentle, yet it manages to really do an excellent job cleansing your face. A lot of people tend to skip toners, which is too bad since they are a crucial step in any skincare regime. Based on my own skincare needs, I like to use toners that aren’t very astringent (meaning, they won’t dry my skin out too much). 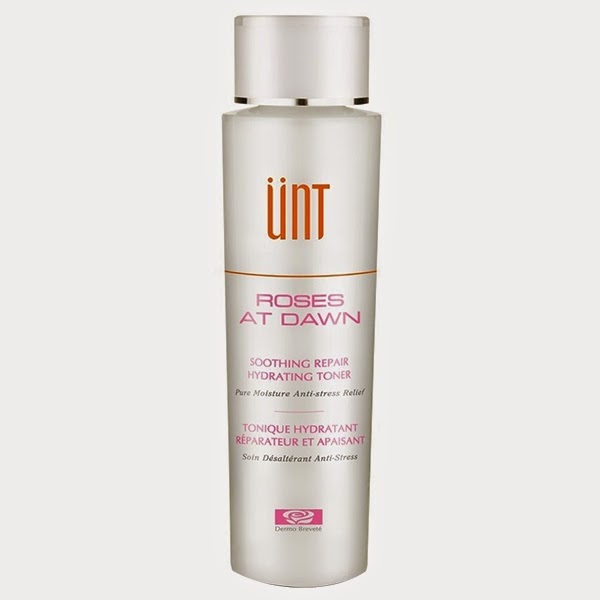 My longtime favourite has been the UNT toner Roses At Dawn, which contains soothing Bulgarian rosewater. The toner also contains a serum which is designed to protect your skin from environmental pollutants, so that’s a bonus! 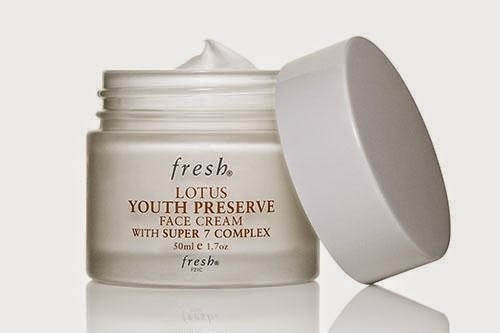 Now, when it comes to facial creams, you’re absolutely going to want to use two. One for the surface of your face, and the other for your eye area. The reason for this is because our eyes are very sensitive and the skin surround our eyes is generally thinner, with a different set of needs than the rest of your face. Some people use four different creams, one for your eye area in the morning, one for your face in the morning, one for your eyes at night, and another for your face at night. If you have fairly low maintenance skin, you don’t really need to be using that many different products on your face on a daily basis, but as long as you’re using them correctly, it doesn’t really hurt either. Anyway, to finish off, I’m just going to talk about eye cream and face cream for daily use during the warmer parts of the year. In summer, I tend to see a lot of gel based products flying off the shelves, although I personally have not had much luck with them. The reason for this is because my skin needs aren’t the kind that a gel based moisturizer is designed to address. If you have particularly oily or acne prone skin however, I would absolutely recommend using a gel based moisturizer somewhere in your skincare routine. 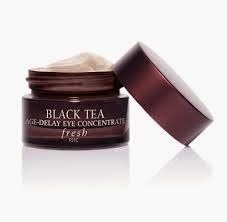 For me, I use…surprise, surprise, Fresh Black Tea Age-Delay Eye Concentrate, and Fresh Lotus Youth Preserve Face Cream With Super 7 Complex. These two products are absolutely amazing and I can honestly say, I can’t imagine even wanting to try anything else because I am just so happy with these two products. The eye cream is great for spring and summer because it offers a cooling effect which really helps with puffiness, while the black tea actually brightens dark circles and visibly tightens the eye area. The face cream is a really lovely, soft texture with a clean scent (reminds me a bit of cucumber sometimes), that is light enough to not feel heavy, but still potent enough to leave your skin feeling moisturized. 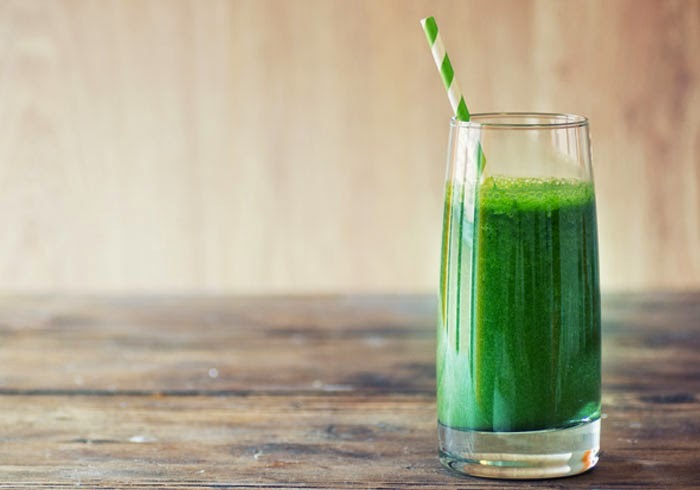 It’s packed with antioxidants to help prevent signs of ageing and boost your skin’s radiance! To be completely honest, shopping for athletic clothing at the beginning of April can actually be quite a challenge. By now, most places have gotten rid of their winter gear and have started to replace it with a variety of brightly coloured, summer pieces, that as great as they may be, really aren’t realistic until the weather warms up at least another 15 to 20 degrees. For athletic gear, I like to have a good mix of high end and low end gear, because let’s be honest, we’re just going to be sweating in it anyway! My current shopping list for spring athletic gear consists of a few pairs of crops, some basic sports bras, a handful of racer-back tanks, and hopefully a new gym bag and water bottle. Once it gets closer to summer I’ll add in a few pairs of shorts (I’m hoping I’ll get a pair of Lululemon Run: Speed Shorts for my birthday in June), but for now, I’m sticking with crops. In terms of finding the perfect racer-back tanks, I haven’t had very much luck yet, but I have come up with a few simple DIY ideas that I might try instead. Essentially, what I’m looking for are simple, relaxed fit cotton racer-back tank tops in a few specific colours. Since it’s still a bit cold to be outside jogging in crops and a tank tops alone, I’ve also looked into a few lightweight jackets to help block the wind. I currently own two pairs of running shoes, my Nike Free Run 4.0 V3 in black and white, and a pair of bright blue and neon orange Saucony Excite 6 runners. 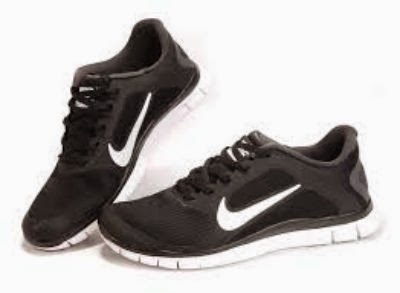 At first I was resistant to coloured running shoes, but to be honest, they have really grown on me! There are so many fun styles out there! If some of the more expensive brands are a bit out of your budget, you can get the same look from the Champion brand sneakers available at Payless. The Champion Atlas Runners in pink are actually really cute and the Champion Gusto Runnerscome in 25 different colours online! To complete your spring athletic gear, you absolutely can’t forget about the accessories. I’m currently pining after a new gym bag and water bottle so I can drink my lemon and cucumber water on the go. After all, it’s important to stay hydrated!